By Mike KrumboltzDec. 21, 2012, has long been rumored to be the day of the Mayan apocalypse, when Earth comes to its inglorious end. The good folks at NASA want you to know that isn't going to happen. In fact, NASA is so confident that it recently published a video that appears as if it were intended to be aired on Dec. 22. Titled "The World Didn't End Yesterday," the four-minute clip explains how the idea of the Mayan apocalypse was a huge hoax and how the rumors began. A commenter on YouTube jokes, "The correct title for this video: Told ya so!—Love, NASA." Time magazine reports that the space agency has been besieged with questions from citizens worried that their lives are about to end. NASA is taking the fears seriously, not because there is any danger, but because irrational fears can sometimes lead to irrational and dangerous actions. NASA's official site features an area dedicated to debunking the claims. "The world will not end in 2012," NASA writes. "Our planet has been getting along just fine for more than 4 billion years, and credible scientists worldwide know of no threat associated with 2012. "Mayan Festival at National Museum of the American Indian Celebrates Bak’tun, Dispels Misconceptions About 12-21-12What NASA is debunking with science, indigenous groups are debunking with information about what the Mayans actually predicted. Which was nothing, except for the changing of a calendar page akin to flipping from December to January, or to the turning over of an odometer. A misunderstanding of the Mayan calendar has sparked panic the world over, sending people from Russia to China to the U.S. into extremes of preparation frenzy or suicidal depression. Working on two fronts, scientists and indigenous experts have embarked on a common mission: to calm everyone down and convince them not to do anything rash in the face of the upcoming winter solstice. The passing of the Mayans’ Bak’tun 13, otherwise known as the end of the Long Count Calendar, is a cause for celebration rather than dismay, and this weekend the National Museum of the American Indian (NMAI) sets out to highlight just that. Bak’tun 13: A Guatemalan Celebration of Time, a free festival from December 14 through 16, will showcase dance performances, lectures, workshops for families and Guatemalan cuisine in the museum’s Mitsitam Café. By Alex HalperinEarlier this year Reuters reported that 10 percent of people believe the Maya 2012 phenomenon could signal the end of the world. Speculation surrounding the advent of the apocalypse has gained enough currency that a cranky NASA astrobiologist taped a video explaining that tomorrow will not be doomsday. What’s going on? Tomorrow is the date 13.0.0.0.0 in the Maya’s (the generally accepted anthropological term) “long count” calendar. Remember the hoopla attending Y2K? This milestone is “almost exactly analogous to the end of the millennium for us,” according to Todd Little-Siebold, a professor of history and Latin American studies at the College of the Atlantic.And:At the same time, the 2012 phenomenon has had real-world consequences. Little-Siebold of College of the Atlantic, said there has been an effort in the Maya region of southern Mexico and Central America to capitalize on 2012 besotted tourists. He added that during Guatemala’s long civil war there was a resurgence of interest in the Maya, in part because it was safer to organize around “cultural” topics like the ancients than “political” issues of the present. A renewal of interest in Maya civilization got another boost in 1992, the 500th anniversary of Columbus’ arrival in the new world. By Alexandra AlperThousands of mystics, New Age dreamers and fans of pre-Hispanic culture have been drawn to Mexico in hopes of witnessing great things when the day in an old Maya calendar dubbed "the end of the world" dawns on Friday. But many of today's ethnic Maya cannot understand the fuss. Mostly Christian, they have looked on in wonder at the influx of foreign tourists to ancient cities in southern Mexico and Central America whose heyday passed hundreds of years ago.And:[O]ver the past few decades, fed by popular culture, Friday became seen by some western followers of alternative religions as a day on which momentous change could occur. "It's a psychosis, a fad," said psychologist Vera Rodriguez, 29, a Mexican of Maya descent living in Izamal, Yucatan state, near the center of the 2012 festivities, the site of Chichen Itza. "I think it's bad for our society and our culture. "And:Mexico's government forecast around 50 million tourists from home and abroad would visit southern Mexico in 2012. 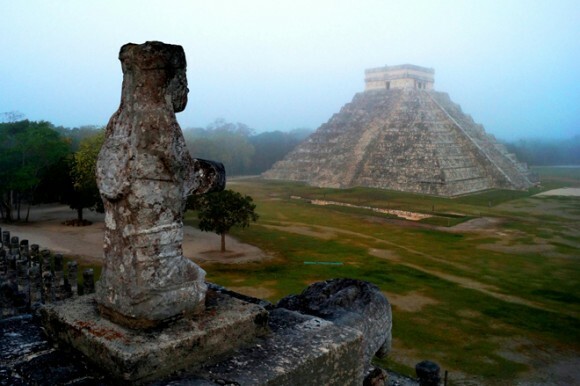 Up to 200,000 are expected to descend on Chichen Itza on Friday. "It's a date for doing business, but for me it's just like any other day," said drinks vendor Julian Nohuicab, 34, an ethnic Maya working in the ruins of the ancient city of Coba in Quintana Roo state, not far from the beach resort of Cancun. Watching busloads of white-haired pensioners and dreadlocked backpackers pile into their heartland, Maya old and young roll their eyes at the suggestion the world will end. "We don't believe it," said Socorro Poot, 41, a housewife and mother of three in Holca, a village about 25 miles from Chichen Itza. "Nobody knows the day and the hour. Only God knows. "Comment: For more on 2012, see "Mayan Apocalypse" in Glee and Countdown to Non-Apocalypse Begins. So in short, no surprises. Told ya.